Malta, an archipelago at the center of the Mediterranean, is an island country in Southern Europe that portrays rich historical roots; lively and colorful culture and traditions; unique flavors of the Mediterranean; and a splendid climate year round. With its landscape and surrounding waters, the country is home to many outdoor sports and activities for both the locals and tourists. Among its islands, only the major islands of Malta, Gozo, and Comino are populated. By Maltese standards, January is the coldest month with an average temperature of 12.5 oC. Although relatively mild compared to temperatures in other European regions, its highest temperature during the month only reaches 16 oC. The month has an average of 158 hours of sunshine and approximately 12 rainy days. Since temperatures in January usually drop the lowest at 10 oC, and waters are at 15 oC, swimming during the month is not encouraged. Instead, you may visit and explore galleries and museums, and enjoy indoor spectacles at night. You may start your morning with a trip to the Cathedral Museum known for its more than 2,000 collective displays, ranging from paintings to Cathedral archives. Its architecture also serves as a marvel with its Baroque design built from local limestone. For a more contemporary experience, you may check the Christine X Art Gallery, a contemporary art gallery operating in Tas-Sliema since 2004 featuring works of professional local artists. End your night with a blast with a visit to the Chamber of Mysteries dinner show where you will awe in wonder and amazement with the magic feats and Maltese-inspired buffet dinner. Like the previous month, February also enjoys a cool weather. Its average temperature starts from 12 oC and increases to 13 oC near the end of the month. Its lowest temperature may drop to 13 oC while its hottest may reach 16 oC, which somewhat similar to that of January. The month enjoys relatively more sunshine with approximately 171 hours and fewer rains with about 7 days. Perfect ventures for the month are usually indoors due to the cold weather. However, a popular public holiday celebrated on the month is the Feast of St. Paul’s Shipwreck held every 10th of February. The feast is deemed a public holiday as St. Paul serves as the patron saint of the island for converting the Maltese to Christianity. During the day, most people go for boat rides with their families or attend the celebration in Valletta. What better way to celebrate indoors in Malta with a taste of their very own savory pastry, the Pastizzi. This flaky pastry is filled with ricotta cheese, peas, or chicken, perfectly blending with its buttery flavor. Jeff’s Pastizzeria is known for its delectable pastizzi in Gzira. March marks the transition from winter to spring, however, subtly, with sunshine periods extending to 223 hours, and average temperatures starting from 13 oC and hiking to 15 oC by the month’s end. Temperatures also peak at 18 oC and drop at 15 oC. An important celebration during the month is the Jum il-Ħelsien or the Freedom Day celebrated annually on the 31st of March. The feast commemorates the withdrawal and departure of the British Troops and Royal Navy from the island in 1979. The celebration is marked with traditional formalities like parades and speeches. An activity to view for tourists and locals is the regatta traditionally held at the Grand Harbor. Another celebration during March is the Feast of St. Joseph, which is celebrated in Mdina, the “old capital” of Malta. After the end of the mass, usually at the National Sanctuary of Saint Joseph and the Church of Saint Mary of Jesus, a colorful procession begins where bands take part. The feast is accompanied by fireworks displays conducted before, after, and during the processions. A slight increase in temperature can be observed in April when average temperatures are estimated at 15 oC by the start of the month, increasing to 17 oC by the end. Rainy days are significantly less, manifesting for about four days, and eventually making room for 246 hours of sunshine. On the average, temperatures peak at 20 oC and drops at 17 oC. With the significant increase in temperature, April is the high time for outdoor sightseeing, day tours, and sportive activities. Plan your outdoor fun when the temperature hits 20 oC with land sports like horse riding and golfing in Marsa. The best tip for tourists is to visit at the end of the month for the Malta International Fireworks Festival held in the Grand Harbour, Marsaxlokk, and Xaghra Gozo. Apart from loving fireworks displays, the Maltese are also popular for their own feats and products. And during the festival, the Islanders get to showcase their pyrotechnical talents and goods. A significant increase in temperature occurs in May when the average peak rises to 24 oC and drops at 20 oC, while the mean temperature throughout the days is at 20 oC. By this time, the Maltese enjoy gentle breezes and more sunshine at about 301 hours the entire month, leaving about two rainy days. Thanks to the sunny and dry time, May serves as the perfect season to stroll along the beaches and dip in the water. If you wish to see one of Malta’s finest, visit Golden Bay. Although underdeveloped, the beach has jet skiing and paragliding services among others, and areas perfect for picnics. At the limits of Mellieħa, you will find the Anchor Bay, the Popeye Village where the Popeye movie starring Robin Williams was filmed. You may enjoy its generally calm and pristine waters trudging down a slope; however, only good swimmers are encouraged to try the waters. In June, the warm weather finally sets in with the highest temperature reaching 29 oC, average temperature at 23 oC, and low temperature at 24 oC. By this month, the archipelago is subjected to approximately 327 hours of sunshine. The month of June is when tourists start to pour in the island. Beaches, like those in the Buġibba and Qawra area, are the top sites visited during the month. For those interested to immerse in the local culture and music, the Għanafest is a music festival featuring Maltese folksongs celebrated annually on June. July is one of the peak months for vacationing in Malta. Water sports are at an all-time high during the season due to the dry and sunny weather, reaching an average maximum temperature of 32 oC, minimum of 27 oC, and an average temperature of 27 oC. At this month, the Maltese enjoy about 366 hours of sunshine. For the month of July, indulge yourselves with Malta’s land and water sports, cuisines, culture and heritage, and other unique offers. Try hiking, rock-climbing, go-karting, scuba diving, and sailing for a taste of the island’s land and water sports. You may also opt to wonder about the islands’ medieval towns, scenic shores, and historical sites (Ggantija Temples). For a unique experience, visit the Marsovin Summer Wine Festival annually held at the Hastings Garden. Enjoy local wines crafted and gathered from the islands of Malta and Gozo with live performances during the event. Just like July, August is also a peak month for tourists. The average hottest temperature is at 32 oC, with water temperatures reaching 26 oC, significantly warmer than the previous months and perfect for excursions in the beach. The average daily temperature is at 27 oC, which may drop to 22 oC. At this time of year, beaches are crowded with tourists and locals due to the hot and dry weather. Thankfully, Malta has numerous beaches you can visit from popular and highly developed resorts to underdeveloped and virgin beaches. The most popular and highly developed resort in the island is the Radisson Blu Resort situated at the heart of St. Julian’s, giving away a perfect view of the Mediterranean Sea and Grand Harbour, and access to numerous nearby establishments like restaurants and casinos. For a genuine Maltese experience, visit the Ta Cassia, a family restaurant operating in a vintage-style farmhouse common in the island. The place offers meat and fresh fish in a variety of Mediterranean cuisines. Patrons will surely enjoy the food and the accommodating service staff. 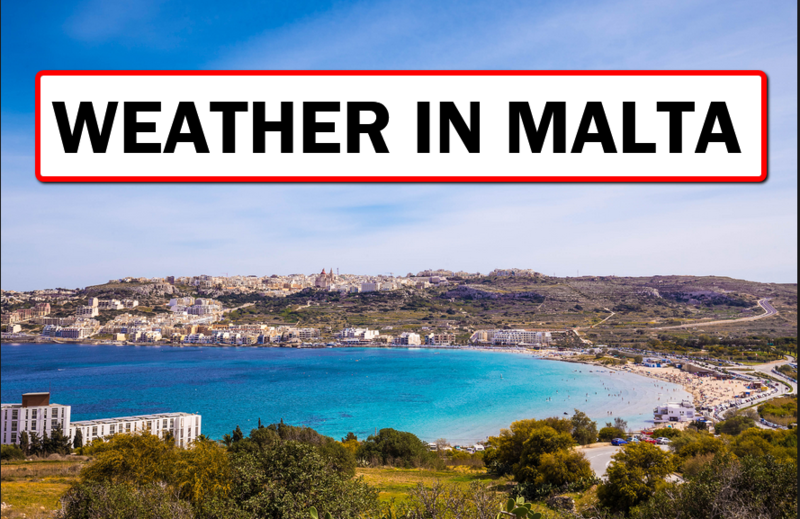 Starting September, Malta still experiences a hot and sunny weather daily, however, milder than that of July and August. At this time, the average coldest temperature falls to 25 oC, its hottest at 28 oC, and its prevailing at 25 oC. By this quarter, Malta experiences less sunshine with only about 261 hours of it for the entire month. August may be the high-time to visit and enjoy the beaches, but September attracts numerous visitors as well due to the fading number of beach goers; leaving beaches with sizeable areas to sunbathe and play beach sports. Apart from swimming, you may also want to try visiting a famous sea cave in Malta – the Blue Grotto near Wied iz-Zurrieq. The cave is known for its wonderful features and reflections of the azure waters. In the ancient days, the grotto was set as a marine temple and personal pool of Emperor Tiberius. Another Maltese pride is the Malta International Air Show. This event has been celebrated annually since 1993 and is held at the Malta International Airport. Aircrafts invited for the aerial feat may be local and international, some military and others general purpose aircraft. In October, the cold season slowly manifests with the gradual cooling of days (approximately 12 rainy days) and lesser sunshine, at about 220 hours for the entire month, thanks to the low pressure coming from the North Atlantic Ocean. Usual days of the month are at 21 oC dropping to 18 oC during its typical coldest, and peaking at an average of 25 oC. Gentle breezes are also apparent during this month. A lesser-known festival for tourists during October is the Ħamrun Chocolate Festival celebrated in the town of Ħamrun, one of the islands’ major market spots. Although the town is typically quiet, this annual celebration livens up the streets where thousands of visitors indulge with numerous chocolates displayed and sold on the streets, while being entertained with various performances. Another regatta in Malta is the Rolex Middle Sea Race celebrated every October. The yacht-racing event was founded by the Royal Ocean Racing Club and Royal Malta Yacht Club where competitors race for 606-nautical miles, circumventing Sicily. On the average, November is considered one of the wettest months of the year in Malta. However, rainfall would largely depend on the distance of the low-pressure systems during the month. During this time of year, the average low temperature is recorded at 18 oC, its usual at 17 oC, and its peak at 21 oC. Consequently, there are more chances for rain, with about six days, and lesser sunshine at around 183 hours. When visiting Malta on November, try attending the Three Palaces for a taste of Maltese culture and heritage in a mix of different performances. Built on the spirit of participation, the Three Palaces Festival aims to incorporate Malta’s music and setting, creating avenues for dialogues among the audience, musicians, and future talents and leaders. A unique festival celebrated in Malta is the ŻiguZajg International Arts Festival for Children and Young People. The event is geared towards children and the youth for the appreciation and exhibit of arts in the forms of clowning, dance, film, literature, music, puppetry, street art, among others. Maltese companies, along with other international companies, join hands to provide nine days of arts and fun for the youth. The month of December is considered the wettest. However, similar to November, rainy days are affected by the low-pressure systems. Temperature averages during the month are at 15 oC during the coldest, 14 oC on the average, and 18 oC on the hottest. December, among other months, sees the least sunlight with approximately 150 hours of sunshine the entire season, and about six rainy days. Predominantly Christian, Malta celebrates a number of religious feasts on December, one, in particular, is the Il-Kunċizzjoni, better known as the Feast of the Immaculate Conception. During the feast, separate liturgical celebrations and accompanying street revelries are held in the harbor town of Citta Cospicua (also known as Bormla). December is also the best time for hiring a car in Malta because the roads are not so busy like in the peak tourist season from May to October. Complete the Maltese experience by dining in one of Valletta’s lesser-known restaurants, Legligin. This hidden gem in Valletta serves one of the best local Maltese cuisines and other Mediterranean options. Servings are in shareable portions fit for a taste of the whole or half of the menu. Like the typical Maltese, seafood dishes like mussels, octopus, and fish are served fresh. Along with these are foods available from nearby areas like the North African lamb stew. For a taste of traditional Maltese dishes, visit the Ta’ Marija where food and performances are tailored for an exquisite experience of Malta. Their menu includes ravioli stuffed with ricotta and served with the ever prominent Maltese savor – tomato sauce. Local performers are also present while you dine, performing as you enjoy their distinctly Maltese dishes. Malta, an archipelago at the center of the Mediterranean, is an island country in Southern Europe that portrays rich historical roots, lively and colorful culture and traditions, unique flavors of the Mediterranean, and a splendid climate all-year round. With its landscape and surrounding waters, the country is home to many outdoor sports and activities for both the locals and tourists. Among its islands, only the major islands of Malta, Gozo, and Comino are populated. On the average, Malta enjoys a mean temperature of 19 oC and gentle breezes at 14 km/h. With its perfect location between Sicily and the north coast of Africa, the average highest temperature in the archipelago may reach 32 oC and drops at 9 oC. August is the hottest month reaching 27 oC on the average when most outdoor activities like swimming and other sports are encouraged to beat the heat. The coldest month falls annually on January with temperatures dipping at 10 oC; the season perfect for hot cocoas and Maltese broths like Brodu Tat-Tigiega (Chicken Broth) and Brodu Tal-laham (Beef Broth).